Christmas time calls for special ways to decorate your porch and front door because this is the point of entry into your home and you want to make it exceptional for the festive yuletide season. There is something outstanding about cheery and merry entrance areas of a home at Christmas. It not only depicts a sense of merriment and high-spirits within the home, it is also a clear indication of what type of Christmas decor to expect within the home's interior. At this special time of the year, traditional Christmas decorations which includes anything from the traditional Christmas tree and its strings of shimmering garlands, to glass baubles, glitter, bells, angels, candles, snow globes, candy canes, and pine cones are used lavishly indoors. But with the exterior, not much attention is paid to Xmas decorations. The exterior is either left bare and bereft of any decoration and if there is any, it will probably be a stringy garland or a non-descript wreath hung on the front door. 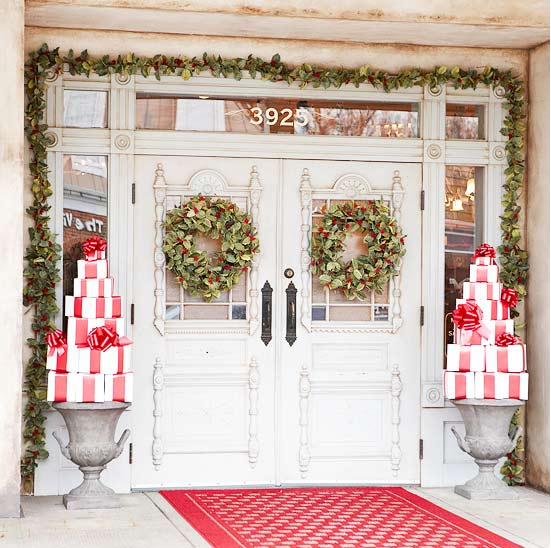 Today, decorating your porch and front door goes beyond garlands and scant wreaths and you will find that there are several more creative ways to decorate the entry of your residence. The good thing too is that they are quite affordable to put together and set up, and best of all, they are re-useable which means you can use the items again and again; every Christmas, for years. Before you can decide on the best way to decorate, you must think about what will suit your porch and entrance door best. The size of your porch or entry area. The type of front door - Is it a single or double leaf door? Its surrounds - Do steps lead up to the porch or is there no porch at all? Colour scheme - There are basic Christmas colours and they are red, green, and gold. But there is no hard-and-fast rule on what to use. Let your theme decide your colour choices. I like to start by viewing my front door and its short adjoining walls as a background for my set up. So, if you have walls on each side of the front door, they will serve as part of the backdrop. If you don't have that much space and, for instance, only have the front door, that's fine too. 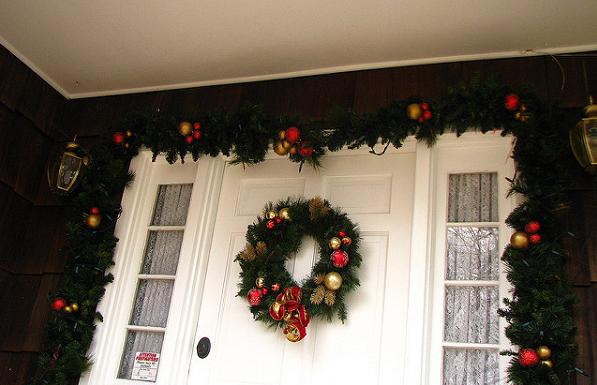 The front door decorations can be a door-hung wreath (hung high or midway) with lights, or a lush garland draped leisurely around the entrance door. You must pay attention to scale. You don’t want to hang an over-sized wreath on a narrow front door or a skinny short garland around a tall wide door. What is now required is to add some Christmassy type of activity around your decorated front door, to one (or both) sides of the porch. Arrange these gift boxes anyway you wish. These faux boxes can be placed in an orderly fashion on the floor of the porch. They can be set as a cluster, haphazardly, in a stack, or as a tower of boxes. For DIY enthusiasts, get some empty boxes or cartons, buy some cheap but colourful Christmas-themed wrapping paper, and make your own faux Christmas gifts. 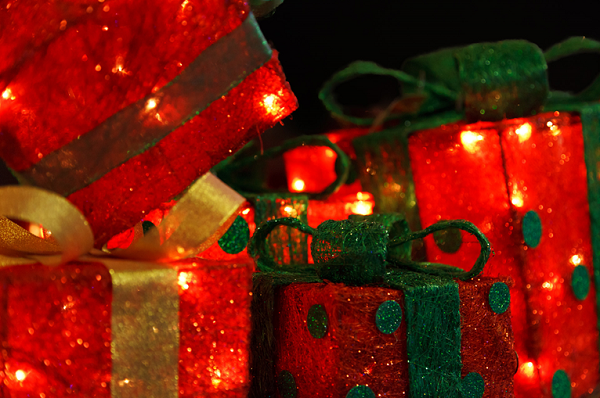 Pre-lit gift box decorations can be placed by the front door or anywhere you think works best for your porch. They are beautiful and can be remotely operated to light up at night. Walking onto your porch and to the front door, with an array of colourful gift boxes almost surrounding you is a lovely, warm, and welcoming way of decorating your entrance area at Christmas.